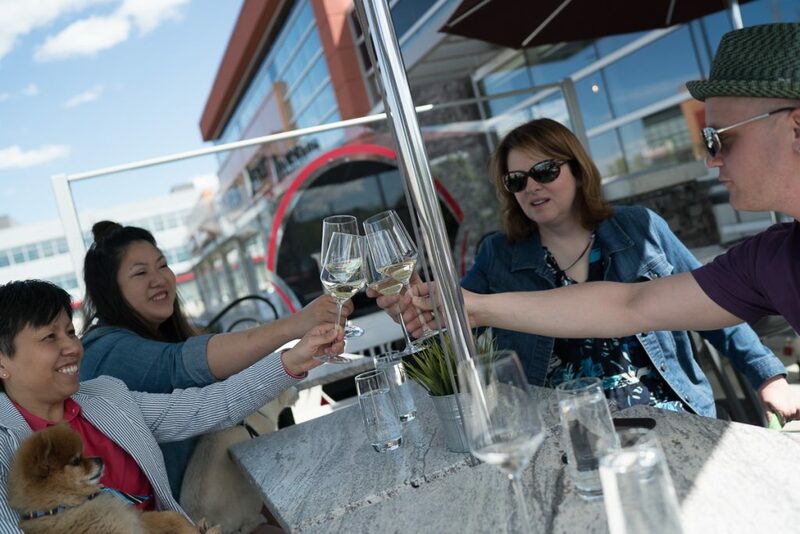 Ever since I put together a list of dog-friendly patios in Edmonton, there’s been such an incredible wave of support from the community – dog owners and dog lovers alike sharing their suggestions for local restaurants and cafes whose patios either put out water for dogs, let dogs sit right under your table, or let dogs sit around the fence or rail close to your table. Some restaurants I found let dogs come right onto the patio, but some that did then back-tracked, saying they didn’t anymore after a bit more public scrutiny. This was disappointing. I knew the Vin Room in Calgary had been approved for a dog-friendly patio earlier this year, so the more my list of sort-of-dog-friendly but not truly-dog-friendly patios got shared, the more I started to wonder why some places could do it, some places could partially do it, and some places couldn’t do it at all. So I reached out to Phoebe Fung, owner of Calgary’s Vin Room, to ask about her process in getting dog-friendly patios approved. What I was surprised to learn from Phoebe is that the process to get a dog-friendly patio approved starts quite simply – by asking. Apparently, not too many restaurants in Alberta have ever asked. So here’s what we all need to know to get more dog-friendly patios approved in Edmonton, Calgary, and across the province! Phoebe with the Vin Room should be credited for being truly instrumental in getting a dog-friendly patio application and process developed. When she first started her pooch-friendly patio journey, Alberta Health Services said they didn’t have requests for this, but were open to working with Phoebe on what the rules could look like. And so they did. After a few versions / edits to her proposals, they finally landed on something. “AHS is ultimately concerned about how you handle food, how you handle food with pets around, and what measures will you have in place,” Phoebe says. A dog-friendly patio permit is in addition to a restaurant’s existing food permit. There’s no additional cost from the AHS side to get this additional permit, but there are costs associated with making sure your patio meets health and safety regulations. If restaurants want a truly dog-friendly patio (dog sitting right up with their fur parents), they need to adjust their patio. Your patio needs to have washable surfaces, there needs to be cleaning stations for pets, and additional signage stating rules. The Vin Room went all out: creating custom-made dog beds, offering a “hydration bar” for the pups, even a wine bottle that hides doggy bags and clean-up stations. Phoebe says the dog beds are dry-cleaned and the patio is power-washed every week. Not all dog-friendly patios need to go all out like this, but “there is no doubt extra cost in order to keep and maintain a dog-friendly patio” just not on the actual permit acquisition. The rules of a dog on a patio are similar to rules of dogs in other areas in the city. Alberta Health Services wants to ensure dog owners are still following city bylaws. Dog need to be leashed. You should only bring your dog if its well-behaved, and ultimately, the dog owner is responsible for the actions of their dog – on the patio or anywhere else they take it. Phoebe is passionate about dogs, and passionate about promoting dog culture in Calgary. I’m the same. I meant it in my previous post when I said summers in Edmonton (/Alberta) are glorious, and I want to make sure I’m able to spend as much of it with my dogs as possible – which means finding as many dog-friendly patios (or other locations – let’s think beyond patios!) as possible. I’m hoping we see more dog-friendly patios, and also – TRULY dog-friendly patios like The Vin Room’s. Ever since their news of dog-friendly patios broke in February, Phoebe says AHS is receiving more calls about how to get their patios dog-friendly. This is awesome. “They’re trying to listen to each person and figure out what they need,” she says. It took her a full year to get her first Vin Room patio approved for dogs, but just a few weeks to get her second location approved. The first one’s always the longest – and lucky for all of us dog lovers, Phoebe’s already done that difficult work. Now it’s just a matter of restaurant/patio owners reaching out and starting that process themselves. So please! Dog lovers, the next time you’re on a patio – ask your server/the manager if they have considered making their patio dog-friendly. Let them know it’s as easy as starting a conversation with their health inspector, and that there are other restaurants in the province going down this route. 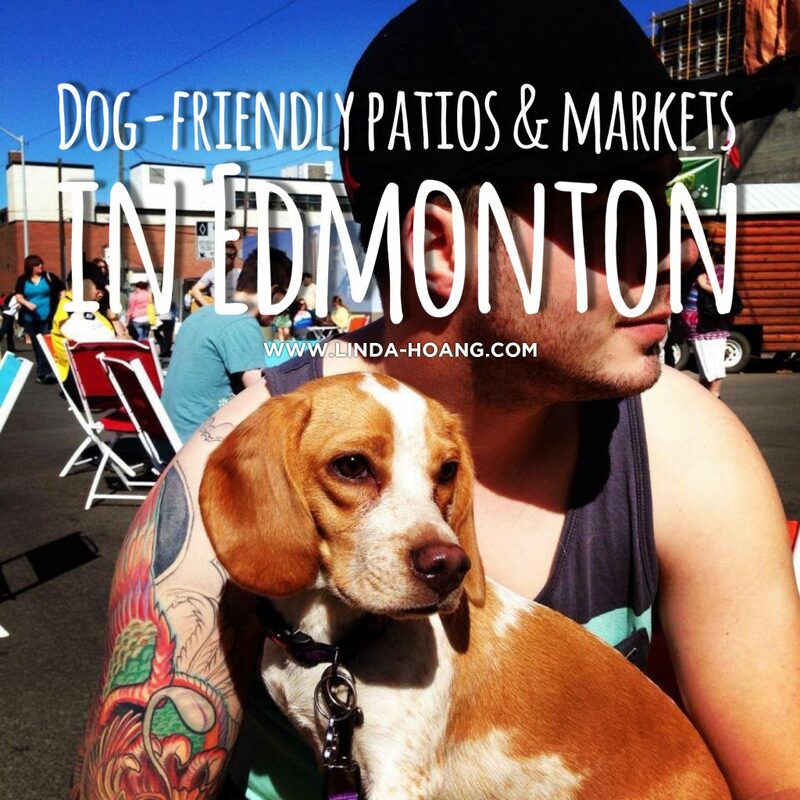 Click to view dog-friendly patios & markets in Edmonton!